and the Standard Oil Company? The front side says, "John D. Rockefeller, 1839-1937. 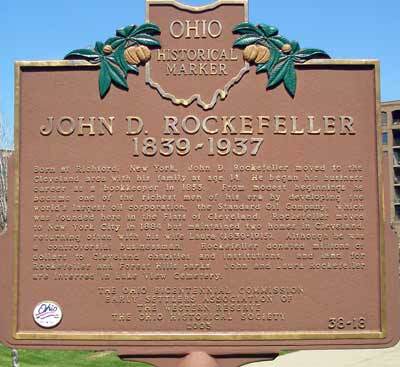 Born at Richford, New York, John D. Rockefeller moved to the Cleveland area with his family at age 14. He began his business career as a bookkeeper in 1855. 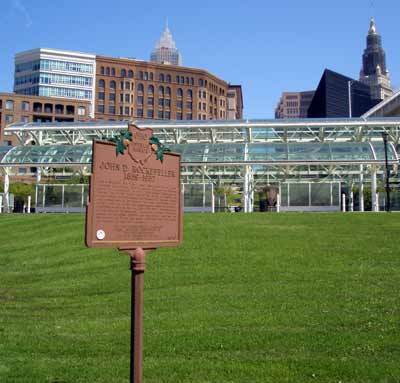 From modest beginnings he became one of the richest men of his era by developing the world's largest oil corporation, the Standard Oil Company, which was founded here in the Flats of Cleveland. Rockefeller moved to New York City in 1884 but maintained two homes in Cleveland, returning often with his wife Laura (1839-1915). Although he was a controversial businessman, Rockefeller donated millions of dollars to Cleveland charities and institutions, and land for Rockefeller and Forest Hills parks. John and Laura Rockefeller are interred in Lake View Cemetery." Near this site in 1863 (the northwest corner of Main and River streets), John D. Rockefeller ventured into the new oil business with partner Samuel Andrews, refining kerosene for lamplight. Their first refinery, the Excelsior Works, was located about two miles upriver, south of Kingsbury Run. 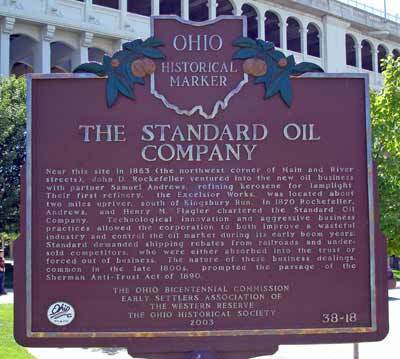 In 1870 Rockefeller, Andrews, and Henry M. Flagler chartered the Standard Oil Company. Technological innovation and aggressive business practices allowed the corporation to both improve a wasteful industry and control the oil market during its early boom years; Standard demanded shipping rebates from railroads and undersold competitors, who were either absorbed into the trust or forced out of business. The nature of these business dealings, common in the late 1800s, prompted the passage of the Sherman Anti-Trust Act of 1890." 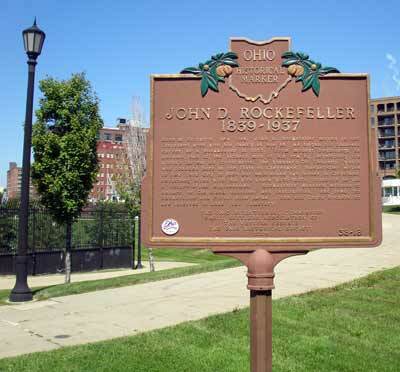 The John D. Rockefeller Ohio Historical Marker in Cleveland is located in the Flats near Heritage Park on Merwin Avenue.